What are the best Lightweight Strollers? Purchasing a lightweight stroller can be a difficult as you want to be sure that the amount of money our spend will equate to both a safe stroller but also one that is efficient and does not add to the difficulty that comes with managing a smaller child and ensuring that everything is perfect for them. Before making your decision there are a few things you might want to investigate first before making your decision. Learning the best and most applicable features will make it much easier for you to purchase a lightweight stroller that suits what you are looking for and will provide a more enjoyable experience. 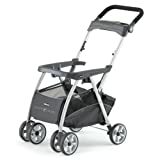 What should I look for in the bets lightweight strollers? There are numerous features that you could want in a lightweight stroller, all of which will in some way satisfy the criteria you want for the best lightweight stroller available. The ones suggested below are the best and most base features you should look at before investigating for more specific functions. You want to ensure that the lightweight stroller can move about and are not difficult to adjust, set up or operate in its everyday use. A stroller that is difficult to use its everyday operation is one that will have trouble operating properly and also inhibits its ability to be used in a safe manner, one of the most important aspects of the purchase. The materials used in the lightweight stroller need to be durable as you want strength and efficiency. If you intend on using the stroller a lot then it will have to go through everyday tasks and maintain its strength. If it uses lower quality material then it will be more likely to break and cost you more in the long run. For the most part you will be using this lightweight stroller for a few years unless you have multiple children, so you will want to ensure that the money spent is not too frivolous but also enough to guarantee quality. You should set an appropriate price range and determine how much you want to spend before purchasing. Key Takeaway: Saving the best on for last, safety is the most important. You want to ensure that your child is safe as well as yourself. Preventing the possibility of hands or fingers getting caught in the stroller as well as faulty parts such as the seat or the seatbelt are also key aspects of ensuring safety. Most strollers should have a safety rating. What are some of the best lightweight strollers available? Listed below are a series of different lightweight strollers that should provide a good variety of selection for you to choose from. They each have their own features and benefits which should provide you the ability to make a decision on which lightweight stroller is the best one to suit your current situation. One of the bestselling lightweight strollers available on the amazon market, this stroller is extremely light weighing at only 12 pounds. Despite its smaller size it can carry from 15 pounds to 50 pounds in its seat. With a small frame of 32 x 15.7 x 8.5 inches, it is versatile as well as compact, making it a very useful stroller. Some of the pros that come with the lightweight stroller include its smooth rolling ability as well as its ability to navigate around easily without too much resistance. Some reviewers state that they can just as easily move with only one hand. Its light weight is also enough to lift and move with one hand without any difficulty. Conversely, some reviewers have stated that they have not received all the appropriate parts to create the stroller when purchasing and that they cannot assemble it as easily as is suggested. Few others have also suggested that the quality of the material is not efficient and a smaller selection of people have had lower quality strollers. This stroller contains a durable frame that is rated for 6 months and 50 pounds, with a taller handle and multi position recline. Additional to this is a 5 point harness for additional safety on the ride. It also has a large parent console and a lower storage basket, adding extra feature and additional usability. The design of the stroller ensures that when you are using it you will not kick the back wheels, saving your feet from pain and the child from being startled. 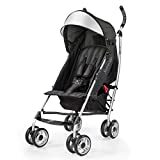 Previous buyers have also stated that the price of the lightweight stroller combined with the variety of features and safety offered make it an extremely useful and overall justified purchase. 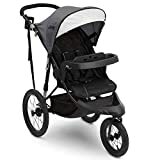 Other reviewers have stated that the seatbelt on the lightweight stroller are not as long as expected that the wheels of the stroller can get wobbly sometimes when pushing it with a child inside. It is also apparently uncomfortable for slightly older children, suggesting it is better for only smaller children. Designed with the Chicco Keyfit Infant car set inside, his stroller is also highly praised by amazon reviewers. Part of the safety functions include an audible click to ensure that the key fit is attached securely. The lightweight stroller also features a premium ultra-light anodized aluminum frame with easy one hand folding. The stroller has a larger size than most strollers, with features such as a basket that is easy to access and an adjustable handle that makes it easy to move it around as you see fit. Additionally the wheels are smoother and provide a much better ride and easier ability to push the stroller with only one hand. Some reviewers have had the unfortunate luck to receive a defective stroller of which the back wheels would pop out and the material apparently felt cheap. Also some have stated that the larger size of the stroller make it difficult to move it around in every day circumstances however this is a smaller occurrence. Consider you and your child’s needs before getting a stroller. If you intend to do a lot of walking and travelling, then definitely invest in a sturdy yet lightweight stroller.